When you are looking for catering services in Desloge, Bonne Terre, Park Hills, Farmington or surrounding areas, our goal is to provide the best tasting food for your special event - large or small. Everyone knows you “eat” with your eyes first. We present our meals in very eye-pleasing settings! Our staff will help to make your event a fun and memorable one. We work hard to ensure you're happy with our food and our service. Call (573) 631-8051 today for more information. 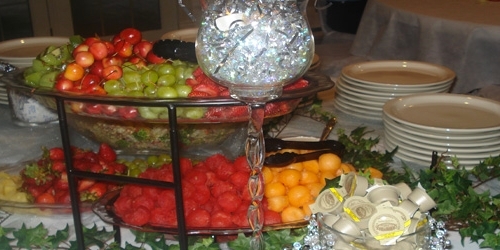 Kim and Bowtie Catering is the most professional catering business in St. Francois county. She has worked with me directly on ribbon cutting and open house events at Belgrade State Bank. I have also observed her work catering many other different events from the fancy to the casual. In all instances, the food, presentation, and service was tremendous. This excellent work comes at a very reasonable value. Kim and her team members are always on time, and she is constantly proposing inventive, out-of the box ideas in regard to menu and/or presentation. Kim Leftridge is of the highest integrity and she expects the same out of her team members. In fact, if their dress is not perfect upon arrival on site, she sends the person home. Kim Leftridge has done a great job for all of the Big & Small events that I have used Bowtie Catering for! For breakfast, lunch & dinners- big & small, it has always been professional, personal & exceptional (in taste & performance). I definately recomend Kim & Bowtie Catering- especially for business lunches, it is so nice to have the food delivered to your appointment & not worry about transporting food & seperate orders! Such a time saver!